I’ve been traipsing around Europe over the past few weeks. I am, as my long-suffering spouse can attest, that person who likes to visit every. Single. Church. I love the history, the nooks and crannies, the hidden secrets — and the range of ways humans design spaces that are meant to uplift and inspire. While in Paris, I was captivated by l’église Saint-Eustache, a stunning gothic church that many visitors pass over in the rush to visit Notre Dame. 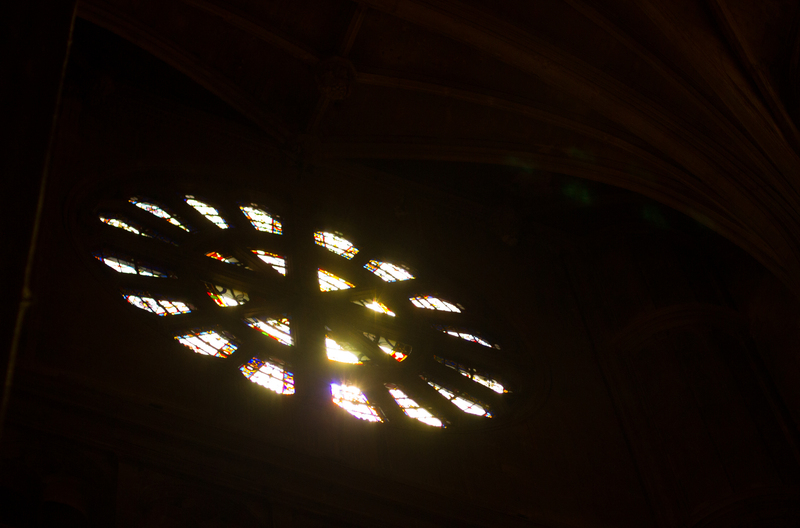 On a late afternoon visit, I arrived as the low-hanging sun centered itself in one of the stained glass windows. “Sunlight in Eglise St-Eustache,” Michelle Weber. The contrast between the window and the surrounding structure was so strong that it obliterated all the details, leaving only shafts of light piercing the stone walls. Although I’m not a person of faith, even I had to pause and allow my eyes to drift towards the heavens (or the ceiling, as the case may be). The photo doesn’t entirely capture the luminance of the moment, but is a lovely reminder for me. This week, in a post created specifically for this challenge, share your own photo showing a CONTRAST. Join me in navel-gazing, or show us something more everyday — your cat cuddled up with your dog, a red car in front of a yellow house, a figure silhouetted against a setting sun. Try a less literal take and snap a shot of the John Grisham and Shakespeare volumes sharing space on your bookshelf, or go totally figurative and share an image of a person you find full of contrasts. We look forward to learning what says “contrast” to you! Oh I love contrasts – I’ll be back on this one. That’s a lovely contrast, Michelle. I’m with you on visiting churches in Europe. They are awesome, in the true sense of the word. I can’t wait to see all the entries. Here’s mine, something that stops my heart and makes me reach for my camera each time I see it. Light and dark – a very intriguing theme! Love the stained glass image! Great theme! Contrast is going to bring in some great and very varied contributions! Creating beauty from pain & mental illness… Taken at our 1st live exhibit which opened last night in NYC: “From Darkness to Light.” An exhibit that represents contrast in many ways, both literal and figurative. A new and great challenge this week looking forward to find the right shot. I needed to add this picture. The boy was staring at something in the air and his eyes are just stunning! will compare and contrast when i get back, right here! All photos shot and procesed using my iPhone. And finally, trees and sky … trees as a frame against the blue sky and white clouds. Stunning image! I can only imagine how awe-inspiring the luminance must have been. Ooh, I love this topic. The hard thing will be finding just one or two. Wow! Amazing picture and a beautiful prompt. Long delays possible Weekly Photo Challenge: Contrast. Flying On Empty Thoughts Leaning Silhouette – A photo prompt. The Daily Doodles of a Doolally Doodler Reflections of the Sun… Daily Post – Contrasts. Le Drake Noir Beautiful noise..? VITHIKA WEEKLY PHOTO CHALLENGE – CONTRASTS. Ouch!! My back hurts!! Contrasting Contrasts? Lines and Wonders! Required Writing More Than States of Mind? Required Writing A View That Ne’er Was? Babsje Heron The Security Cam is Down – Who You Gonna Call for Backup? The numpty with a camera WPC – Contrast a tale of two photos. Ouch!! My back hurts!! Three’s Company! Photographic Showroom Weekly Photo Challenge: Contrast – Listening vs. Seeing. Crap I Blog About Big and… eh… uber-cute and tiny! Zeebra Designs & Destinations There’s No Place Like Home! rfljenksy – Practicing Simplicity Happy 4th of Jul… What the HECK!!!! Stuff and Nonsense Quick! Caption me! LenzExperiments WPC: Contrast & Inside Out! Roaming days Be different, go your own way. Always was a rebel… White…. The Urge To Wander Aesthetic Transitions! Colonialist's Blog THE DAILY POST Photo Challenge: Contrasts: Fair and Dark. KleesButterfly – A TravelBlog Cobblestone Art. Hope* the happy hugger Light under bridge. I do wander everywhere Contrasts – Not a June Wedding!